I love to use yogurt in muffin recipes--and this Lemon Raspberry Muffin with yogurt recipe is no exception. The yogurt adds a creamy texture and tenderness to the muffins--while cutting down some of the usual fat from oils and butter. I typically use flavored, low fat yogurt for the added sweetness and convenience of having some of my flavoring work done for me! Add the raspberries to the muffin batter. Fold in the raspberries to avoid crushing them too much. Fill the muffin tins. Spoon the muffin batter into the lined muffin tins, filling each cup about 2/3 full. Bake and serve the muffins. Bake until the muffins are lightly browned and a toothpick inserted to the center comes out clean--except for clinging berry juice or pieces--about 20-25 minutes for full sized muffin tins or 12-14 minutes for mini muffins. Serve the muffins warm with butter or margarine if desired. 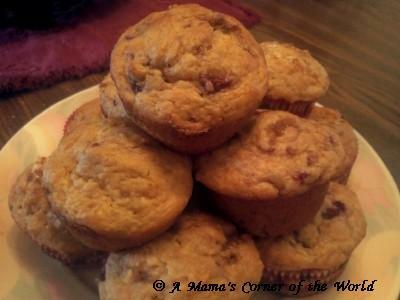 Note: These muffins may be a bit "tart" depending on the sweetness of the raspberries used. The family in a Mama's Corner of the World enjoys fresh berries without sweeteners--so this recipe was fine for us with bits of unsweetened berries in a brown sugar sweetened batter. If you prefer a sweeter muffin--sweeten the berries with a tablespoon of white sugar or honey and allow them to sit for about 30 minutes before adding them to the muffin batter.